If a website can be in beta, then why can't a store be in beta to work out it's kinks? In the spirit of new business models, A Startup Store uses the strategies of startups and launches new retail experiences in beta mode. On December 1st, 2011, the store unveiled it’s first “story,” an exhibition style concept that features rotating products and brands. “Beta” showcases six New York startups that prior to setting up shop in the store primarily sold to consumers only on the internet. Founder, Rachel Shechtman is a retail consultant who has worked with the likes of Gilt Groupe, Tom’s Shoes, and AOL. Google+ is one of the store’s key partners. 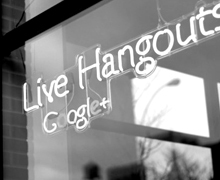 With the store’s “Live Hangouts,” Shechtman invokes the web experience Google+ promotes online, and brings the network mentality to the retail experience. A Startup Store crafts an experience that speaks to the process as much as the product. Online consumers (and Schechtman hopes in-store shoppers) want to be involved with a product from the start. Early adapters are keen to sign up for a product’s beta version and follow it’s progression to launch. We did that with one of our favorite tools, GimmeBar. Users are willing to forgive a few imperfections along the way if they feel invested, and involved, in a project’s success from the start. A Startup Store will move on from it’s eponymic title when it launches it’s second story, “Love,” and a permanent brand on February 1st. The space’s transition to a “Love” story is another timely decision to capitalize on the moment and one of the most commercial holidays, Valentines Day. The brand will stay, but the store will continue to reinvent itself every four to six weeks with new merchandise and a spatial redesign. Stefan Sagmeister will provide the branding which will surely infuse the store with a dose of cutting-edge attitude akin to its concept. It remains to be seen if the space can sustain itself, but in a city with a high retail turnover rate, launching new experiences may just keep customers coming back for more. Read more in Cool Hunting’s post here, and follow the store’s transformation on Twitter.